"Takes readers on a journey through the racial divide in a way we've truly never seen before. Powerful, haunting, and absolutely impossible to put down, [Brown's] account of what it's like to grow up black, middle-class, and female in modern America is not to be missed." —PopSugar, "Best New Books to Read in May"
"A deeply personal celebration of blackness that simultaneously sheds new light on racial injustice and inequality while offering hope for a better future." —Shondaland, "12 New Books to Add to Your Reading List This May"
"Moves the race conversation forward . . . Brown offers a powerful perspective on race with her first-hand account." 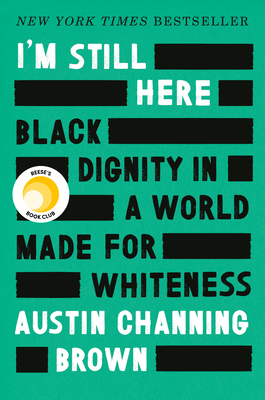 "I read Austin Channing Brown’s incredible book in one sitting. This is one that every black woman needs to read to be validated and every white person needs to read to receive some perspective . . . Brown has concisely articulated the burdens, questions, and frustrations that I find myself experiencing daily as a black woman." "What a stunning debut from a seasoned racial justice leader. Austin does double duty by fiercely affirming blackness while simultaneously unveiling and demystifying the subtle effects of white supremacy among Christians. I trust Austin, I listen to Austin and I learn from Austin. I hope you will too." "The movement toward diversity and forgiveness, [Brown] points out, too often involves white people seeking credit for recognizing the crimes of the past even as they do nothing to fix things today, and black people being required to provide endless absolution and information while calmly enduring dignity-eroding and rage-inducing injustices." "Brown passionately rejects facile reliance on “hope,” stating that “in order for me to stay in this work, hope must die” and “[t]he death of hope gives way to a sadness that heals, to anger that inspires, to a wisdom that empowers me.” An eloquent argument for meaningful reconciliation focused on racial injustice rather than white feelings."